We have some clarity as to the next selection in MLS expansion, as Commissioner Don Garber announced that St. Louis and Sacramento are the last two bids standing to land the 28th team. We’re relatively sure that both cities will land expansion teams, barring something unforeseen. With Garber’s announcement, a lot of uncertainty is removed from the MLS expansion equation—and it sets up another round of uncertainty, as we will inevitably see another phase of expansion speculation, as adding four more teams will be next in the agenda. So whichever group failing to land the next slot will immediately be the frontrunner for the next round. We’re now in the end stages of the current MLS expansion round. MLS has some issues to address in coming years, such as profitability and a streaming-media monetization strategy at a time when pro sports broadcasting is undergoing significant changes. There are also a few stadium issues to resolve in both New York City and Austin, and some underperforming teams that need to address stadium and on-field issues. Still, given how quickly business and operational models are changing in the sports-business world, MLS is remarkably well-positioned to succeed in the next decade. At one point MLS expansion was set to end at 28 teams, but the impressive number of strong bids will surely lead to planning for a 32-team circuit. That’s why there are plenty of contenders for a future MLS expansion team, as several solid ownership groups have been biding their time in the wings, waiting for the league to move forward. In the short term, we’re still looking at a two-city race to land that elusive 28th MLS expansion team, but in the long term we’re seeing some interesting bids take place for the next expansion round. Sacramento: 1-2 Ron Burkle’s decision to invest in MLS, Sacramento Republic FC and a new downtown stadium instantly catapulted that city’s bid to the lead. Sacramento has been mentioned as a leading MLS expansion market in recent years, thanks to a positive local economy, USL success and a new downtown stadium plan in place. Now the local business industry is involved. MLS has been patient in waiting for Sacramento to develop a strong bid; the patience should be rewarded. St. Louis: 1-1 Another solid ownership group with lots of local ties, and a solid stadium plan. An MLS team would replace the NFL in the local sporting scene, and MLS management has spoken highly about the market in recent years. There’s still plenty of work to be done on the stadium plan, but MLS officials speak well of the market. If St. Louis doesn’t land a team this year, you can bet the group will be a strong contender when the next round of expansion opens, with corporate support on the agenda. Phoenix: 2-1 With a solid ownership group, a solid stadium plan, a great USL track record and a desirable market, the Phoenix Rising bid should be enough to land a team. This bid has been flying under the radar, but it seems to meet everything on the MLS expansion checklist. The sports-business scene in Phoenix is in flux, with the Diamondbacks and Coyotes seeking new facilities. Is this a good thing for MLS? If Phoenix doesn’t land a team this year, you can bet the group will be a strong contender when the next round of expansion opens. Charlotte: 5-1 This is a very conditional estimate. Carolina Panthers owner David Tepper has said MLS belongs in Charlotte and held focus groups to gauge fan interest. But decisions about a new stadium vs. a Bank of America Stadium renovation may determine if MLS is truly an option. Building a replacement, a la Mercedes Benz Stadium, would give the city a chance to host not only NFL and MLS but big events like Super Bowls and NCAA Final Fours, and MLS would be a big part of that mix. Renovating Bank of America Stadium, however, may dampen some enthusiasm for doing anything but focus on football, especially if there’s little or no public money for the project. Tepper already paid $2.2 billion for the Panthers and has hinted that he’ll be looking for public money for a practice facility and funding for future stadium plans. Indianapolis: 7-1 With the unveiling of an Eleven Park development that would include a 20,000-seat stadium, Indy Eleven owner Ersal Ozdemir put his MLS aspirations back in the limelight. While the site and specifics about the Eleven Park development still need to be finalized and announced, there’s no doubt Ozdemir is thinking big—and if one thing Anthony Precourt’s pursuit of Austin teaches us, fortune favors the bold in MLS expansion. Bringing in seven new investors helps as well. So much of this ranking depends on the ability of Indy Eleven to land public financing for the development. San Diego: 8-1 With a new San Diego State University stadium in the planning stages, officials there have reached out to MLS about adding a team. 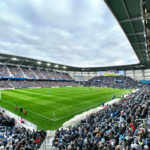 MLS officials have spoken favorably of San Diego as a league market in the past, and while MLS officials don’t like to see their teams as a secondary tenant, the attractiveness of the market may be too tempting to ignore. Raleigh: 9-1 Another bid that will depend on public funding of a new development built around an MLS stadium. North Carolina FC ownership put in a request for Wake County sales taxes to fund $11 million annually over 30 years for a new Raleigh MLS stadium, and looks to be shifting its focus to a larger site that could accommodate more surrounding development. And while the North Carolina FC ownership group will need to bring in some big-buck investors to buy into the league and fund the rest of the project, landing this money would be a good start to the proceedings. Las Vegas: 50-1 Brent Lashbrook has proven Sin City is a viable MLS market by drawing fans to a downtown ballpark not very optimized for pro soccer. Can that USL success be extended to MLS? It would seem a discussion of pro soccer in downtown Las Vegas is worthy of consideration, but it would require a new stadium; we don’t see Cashman Field being capable of being upgraded to MLS standards. And we don’t know if there’s the appetite in Las Vegas and Clark County for another new sporting facility unless it’s privately financed. Detroit: 75-1 The decision not to pursue a retractable roof for Ford Field was a big blow to Detroit’s MLS chances: it forces soccer to be an indoor sport in Motown. There are strong owners here, to be sure, but the facilities issue may be too much to overcome. And while there’s also a huge challenge in being a secondary tenant in an NFL stadium, it works in Atlanta with Arthur Blank owning both teams, and it could work in Detroit with the Ford family involved with both teams. Louisville: 100-1 Local officials want MLS. But the local ownership group says they have no interest in spending the money needed for MLS. Also, the new Louisville USL stadium will need to be upgraded to attract the attention of MLS. With more worthy contenders ahead in line, it would be a challenge to land a team in the next expansion round. Down the line? Yes.